Stem: branches +- erect, 10--30 cm, glandular-hairy. Leaf: glandular-hairy; hairs translucent; lower leaves in suberect rosette, 1--2-pinnate-lobed, axis linear below, winged above, merging with lobes, lobes toothed, teeth short-pointed; upper minute, 2-toothed. Inflorescence: open; pedicels spreading, in unequal pairs, thread-like, glands black, flat-topped, short-stalked. 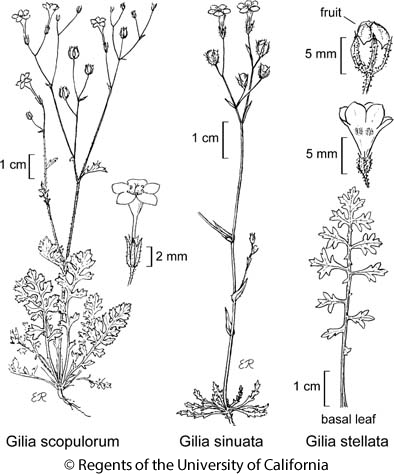 Flower: calyx 3--5 mm, +- glandular, lobes wider than membranes, green; corolla 9--17 mm, 2--4 × calyx, tube purple, throat < tube, yellow, lobes ovate, lavender to pink, acute; stamens, style +- exserted. Fruit: 5--6 mm, <= calyx, widely ovoid to spheric. Seed: 6--9. Chromosomes: 2n=18,36. Citation for this treatment: J. Mark Porter 2012, Gilia scopulorum, in Jepson Flora Project (eds.) Jepson eFlora, http://ucjeps.berkeley.edu/eflora/eflora_display.php?tid=26923, accessed on April 24, 2019.
s SNE, e DMoj, DSon; Markers link to CCH specimen records. Yellow markers indicate records that may provide evidence for eFlora range revision or may have georeferencing or identification issues. Purple markers indicate specimens collected from a garden, greenhouse, or other non-wild location.